Welcome back! I hope you all had a great time over the summer! Please see this post for information about how often we meet, what to expect at Sessions, etc. I hope you have all enjoyed the Summer Break and are looking forward, as l am, to resuming our sessions at the Cumberland and the Millstone. The Cumberland has become part of a campaign called “Shout Up”. This was set up initially to protect women from harassment in bars throughout Newcastle. You can also see posters on the pub walls. This is a “heads up” to anyone who attends our sessions. We play in the Cumberland so we need to be aware of and sensitive to what they consider to be appropriate behaviour. Staff at the Cumberland Arms have been trained to deal with sexual harassment as part of this Campaign. Many thanks for bringing new songs and reviving some old songs that have lain dormant in the Songbooks for a long time! We now have a stash of these to re-visit in Denis’s sessions on 2nd Thursdays. Please hold on bringing new songs/reviving old songs to Thursday sessions until we have got these ones under our belts. For the next few Thursday sessions, we would like to rock steady with some familiar tunes plus the new/old ones you have already brought along to Denis’s sessions. Reminders for everyone for all Thursday sessions, including me! Play it again, Sam! Dot has a good ear for the sort of songs that are likely to become popular in sessions. If you get the nod from Dot that it is a “good song”, take the hint and give it a run at another session asap! Practice makes perfect: It might take a few sessions before everyone is familiar enough with a new song for it to settle in and “work”. This applies just as much to well-known songs (when everyone might have a different version playing in their heads) as to less well known songs (when perhaps only the the song leader “knows how it goes”). Song sheets: You can also use the email list to send song sheets to everyone – but please still bring at least 10 copies on paper when you are introducing a song for the first time. Please note: the Sunday Sessions are not suitable for “Beginners”. Wishing you all a very Happy Xmas! The Xmas Party on 4 December at The Millstone was a blast!! UPDATE: Please note the earlier start and earlier finish – not the usual 6:00 – 8:00! Best wishes – and Happy New Year if I don’t see you on the 28th! Times advertised here are approximate! See TicketSource Page for exact timings! SUMMER BREAK: NO SESSIONS IN AUGUST! Thursday 20 July – Ukes4Fun with Dot and Misspent Uke + Dot’s Birthday! Oct 15th CANCELLED – too many sore throats and laryngitis! Dec 10th * 1:15 – 4:15 * Xmas Party for all Thursday and Sunday players! more dates to follow . . . The Fabulous Del Rey returns to Newcastle on her 2017 UK Tour! This time with the Amazing Adam Franklin! Two Rivers Folk Festival, Wales. 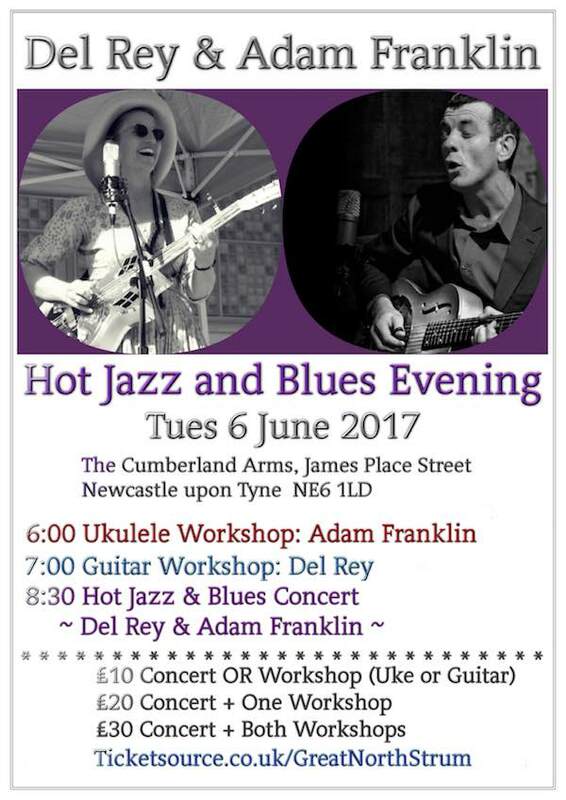 Adam Franklin is a fantastic tutor, as anyone who has attended his Workshop on “Hot Jazz Rhythm Picking for Ukulele” will testify! In this workshop you will learn some easily remembered picking patterns and how to use them to provide a solid rhythmic foundation to ANY song in ANY style – not just “hot jazz”! Whether you are a beginner or a more advanced player, you will find this technique a very useful tool to add that “extra something” to sing-alongs and jams! Chord charts and Finger-Picking Tabs for “Dr Jazz” will be provided – leave a comment on this post if you have booked a place and would like copies in advance! After Del Rey’s last performance, guitarists in the audience asked her if she could come back to run a Guitar Workshop. So that is what Del is going to do for us this time, focussing on “Moving Bass Lines”! Want to play like a pianist? Walking and boogie-woogie bass lines for fingerstyle guitar! Learn the positions where you can find both chords and moving bass. Intermediate-Advanced Level. Standard tuning. Recording permitted. You will need to be comfortable holding partial chords while moving a bass line, and with switching fingers to maintain a position. Any guitarist with these skills who would like to expand their sound in blues and jazz will learn useful vocabulary and ways of using chords they already know. Fingerpickers and players with good fret-hand strength will get the most benefit. Del Rey and Adam Franklin Resonate! Jazz and Blues Duets, swapping instruments and vocals! Del and Adam often run workshops and perform together in the South of England when Del is in the UK. 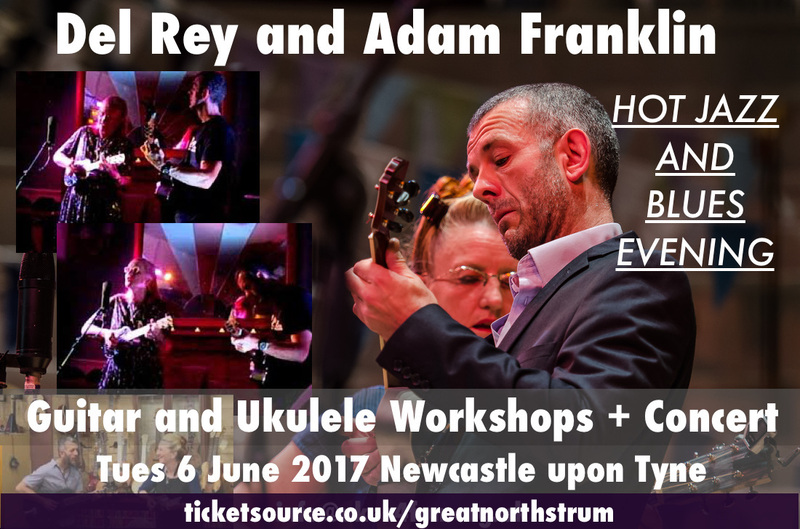 We are so pleased to bring them up to the North East to run Guitar and Ukulele Workshops and perform for us in concert! Tickets – NO Booking Fees! The Workshops and Concert are in the upstairs Function Room. There is a wheelchair-accessible ramp. The toilets are on the Ground Floor and are not officially wheelchair accessible. The Public Bar is on the Ground Floor. There are separate admission times for each event. If you are attending the Ukulele Workshop and then the Concert, you will be able to relax in the Music Room or Saloon Bar downstairs while the Guitar Workshop is running upstairs. Refreshments are not included in the Ticket Price. There are links to download PDF file versions for printing below. Put them on your fridge, your noticeboard, etc. or pass on to friends who might be interested in coming along!